Brown Jelly Syndrome (BJS) is, as the name suggests, characterised by a brown mass resembling jelly. It appears to be floating on the surface of the coral and moves. This disease is also often associated with a rotten smell if handled. 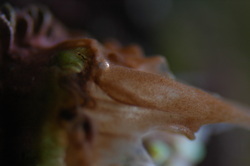 BJS appears to be restricted to aquaria and no reported wild diseases are similar in appearance. 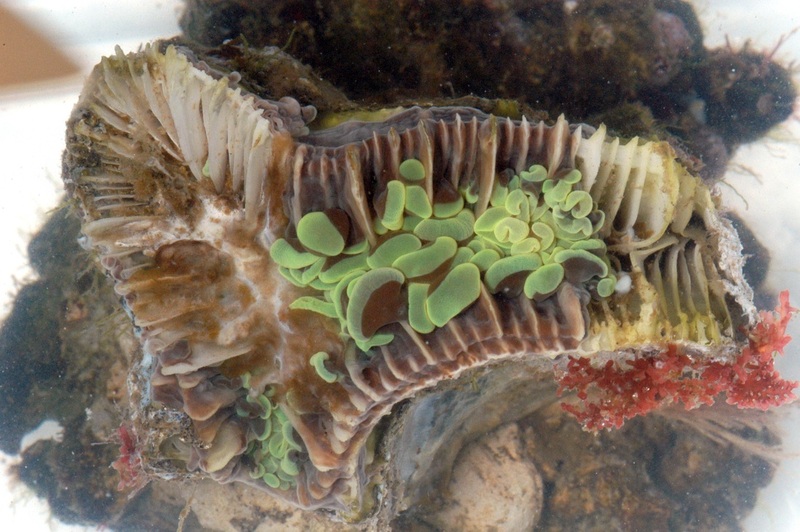 Tissue loss is fast and the disease is very contagious, so can spread to other corals regardless of species. Although the underlying cause may not be known, the pathology of this disease is characterised by very large numbers of the ciliate commonly referred to as Helicostoma nonatum. However, recent research shows these ciliates to be identical to the same ciliates associated with WS in both aquaria and in the wild (Philaster sp.) and closely related to ciliates associated with another wild disease called Brown Band Disease (BrB) which has been associated with Philaster guamensis. 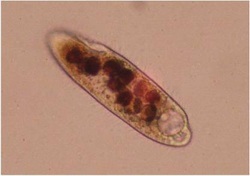 While ciliates are undisputedly present in the brown jelly material associated with BJS, it remains unclear as to what exact role they play in the disease pathology (i.e. are they the primary causal agents or secondary invaders?). This is also the case for the wild type disease BrB. It is feasible they are only present because they are feeding on dead tissue arising from another pathogen or non-pathogenic disease (Borneman & Lowrie, 2001). In support of this, the Zoological Society of London (ZSL) has often but not always isolated Vibrio spp. particularly V. vulnificus from corals such as Goniopora and Euphyllia exhibiting disease signs similar to BJS (Pers obs), however further work needs to be conducted. As with WS, the use of a broad-spectrum antibiotic, such as chloramphenicol (Tifomycine:flexyx.com, only available in USA) and metronidazole is commonly cited. Doxycycline, Oxytetracycline, Iodine and freshwater dips (15 ppt) have all been used. 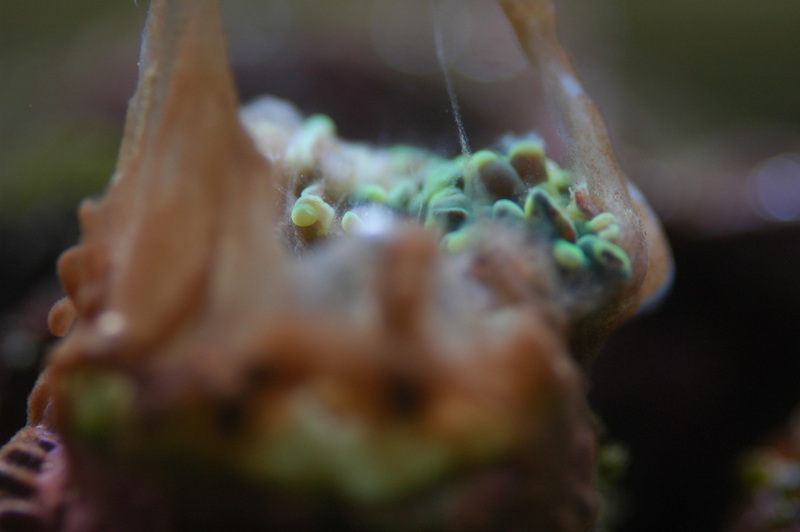 Low salinity should only be used for large polyp species, smaller polyp species such as Acropora do not tolerate low salinity well particularly when they are already stressed by disease. Removing infected areas of a colony well ahead of the line of healthy tissue can sometimes stop the infection from spreading but great care should be taken to siphon off loose tissue first and avoid spreading infected material around the tank. 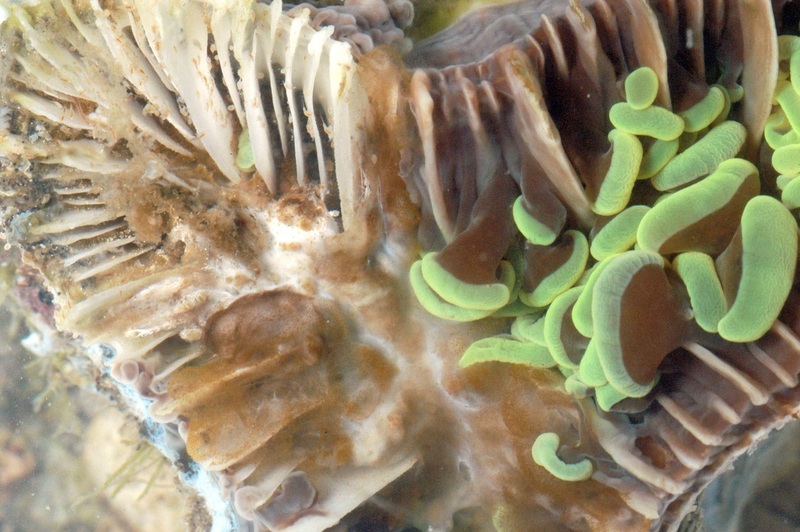 Isolation of any samples showing this disease have also been reported to sometimes stop the spread to other corals. A similar disease, often found in the wild is called Brown Band Disease. Recently studies have proven that ciliates like those reported on here associated with both White Syndrome and Brown Jelly Syndrome are indeed the causal agents and often follow after damage to the coral tissue. Below is the abstract of the recent publication by Stefano Katz from Jame Cook University in Australia. 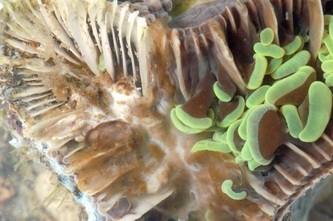 Brown band (BrB) disease manifests on corals as a ciliate-dominated lesion that typically progresses rapidly causing extensive mortality, but it is unclear whether the dominant ciliatePorpostoma guamense is a primary or an opportunistic pathogen, the latter taking advantage of compromised coral tissue or depressed host resistance. 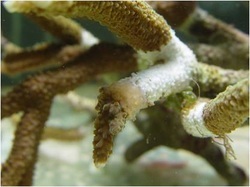 In this study, manipulative aquarium-based experiments were used to investigate the role of P. guamense as a pathogen when inoculated onto fragments of the coral Acropora hyacinthus that were either healthy, preyed on by Acanthaster planci (crown-of-thorns starfish; COTS), or experimentally injured. 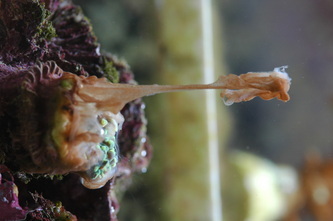 Following ciliate inoculation, BrB lesions developed on all of COTS-predated fragments (n = 9 fragments) and progressed up to 4.6 ± 0.3 cm d−1, resulting in ~70 % of coral tissue loss after 4 d. Similarly, BrB lesions developed rapidly on experimentally injured corals and ~38 % of coral tissue area was lost 60 h after inoculation. 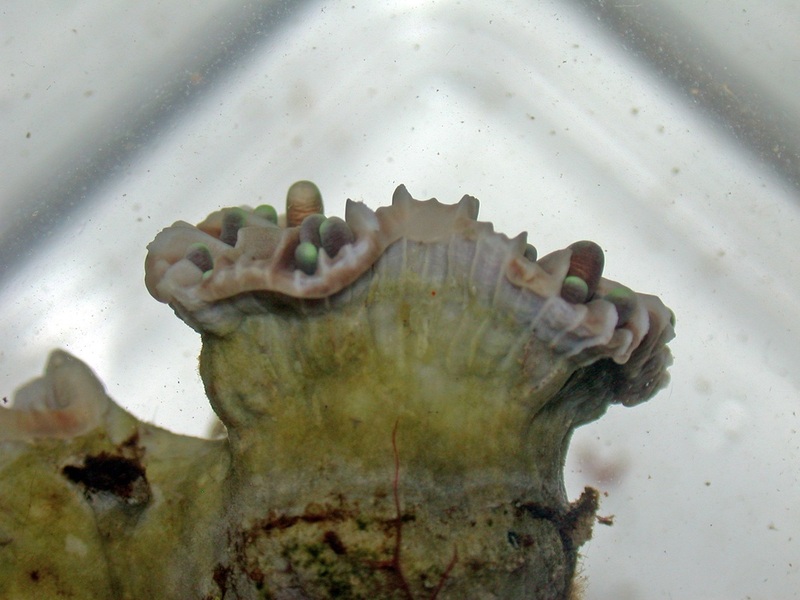 In contrast, no BrB lesions were observed on healthy corals following experimental inoculations. 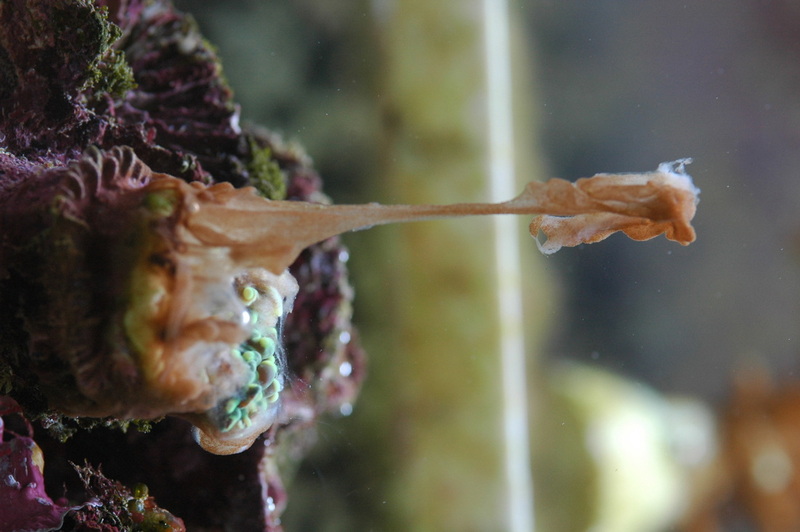 A choice experiment demonstrated that ciliates are strongly attracted to physically injured corals, with over 55 % of inoculated ciliates migrating to injured corals and forming distinct lesions, whereas ciliates did not migrate to healthy corals. Our results indicate that ciliates characteristic of BrB disease are opportunistic pathogens that rapidly migrate to and colonise compromised coral tissue, leading to rapid coral mortality, particularly following predation or injury. Predicted increases in tropical storms, cyclones, and COTS outbreaks are likely to increase the incidence of coral injury in the near future, promoting BrB disease and further contributing to declines in coral cover. For the full article see: Katz SM, Pollock FJ, Bourne DG, and Willis BL. 2014. Crown-of-thorns starfish predation and physical injuries promote brown band disease on corals. Coral Reefs DOI: 10.1007/s00338-014-1153-2.